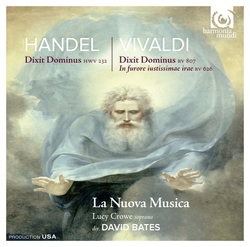 David Bates directs La Nuova Musica in a pair of contrasting settings of Psalm 109. Handel's masterful and ambitious HWV282 was penned in 1707 during a youthful visit to Italy. Vivaldi's vivid and economical RV807 (his third "Dixit Dominus") was long mistakenly attributed to Baldassare Galuppi; it probably dates from the early 1730s. Rounding out the programme is Vivaldi's dazzling motet for solo voice, "In furore iustissimae irae", featuring soprano Lucy Crowe.